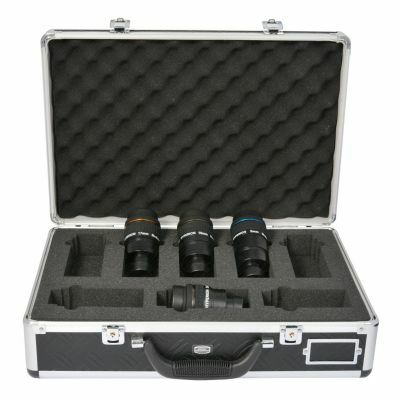 Starter Set of Hyperion eyepieces and Carry Case. Design: The Hyperion design has has both a 31.7mm (1 1/4") and 50.8mm (2") barrel for fitting into either size focuser or diagonal. Both barrel sizes have a safety groove for safe use in your telescope. Each Hyperion features Baader's PHANTOM-GROUP Multi-Coatings for maximum light transmission and the ultimate in image contrast. There are two photographic threads on each Hyperion, M43 and SP54. These threads are located under the rubber eye-cap, or rather beneath the thread protecting ring which is made of high-quality and aging-resistant silicone rubber. Baader Phantom Group Coating: Baader Phantom Group Coating is a 7-layer broadband coating with extremely low residual reflection. The term "Group" refers to the fact that for each type of glass used in the Hyperion eyepieces, the respective effective anti-reflection layer is applied. All these different anti-reflection coatings on each lens surface have then been optimized to be most effective where the human eye has its highest sensitivity at night - at about 520 nm - in the green region of the spectrum. Adapting your Hyperion: The Hyperion can be combined with a Baader adaptor ring to mount a camera directly onto the eyepiece. In addition, there are a large number of Baader adapting rings and fittings to make the Hyperion suitable for (almost) every task in astronomical - and nature - photography, as a high quality projection optic or as a tele-extender. The Hyperions work as well for photographic applications as they do for visual use. "outstanding set of eyepieces I have used cheap ones till I got these and there is no comparison these are a must have I use them for all types of viewing can't praise them enough"